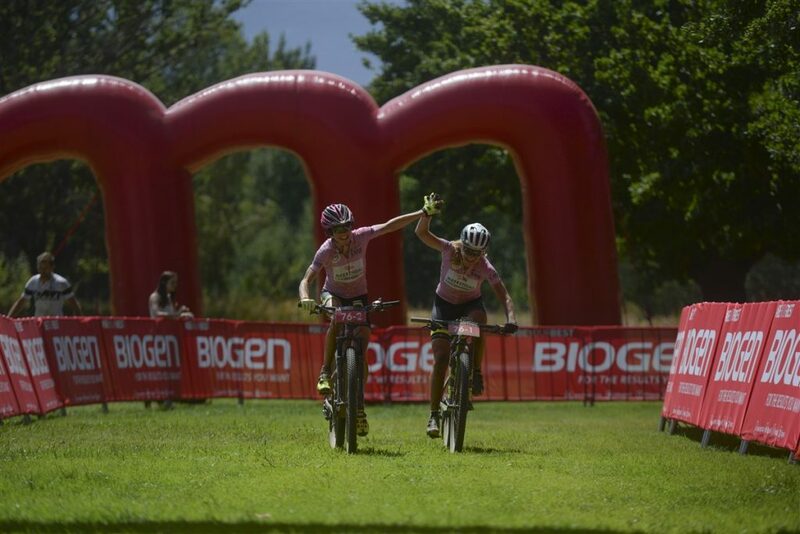 Yolande de Villiers (left) and Mariske Strauss celebrate winning the final stage of the Momemtum Health Tankwa Trek, presented by Biogen on Sunday. 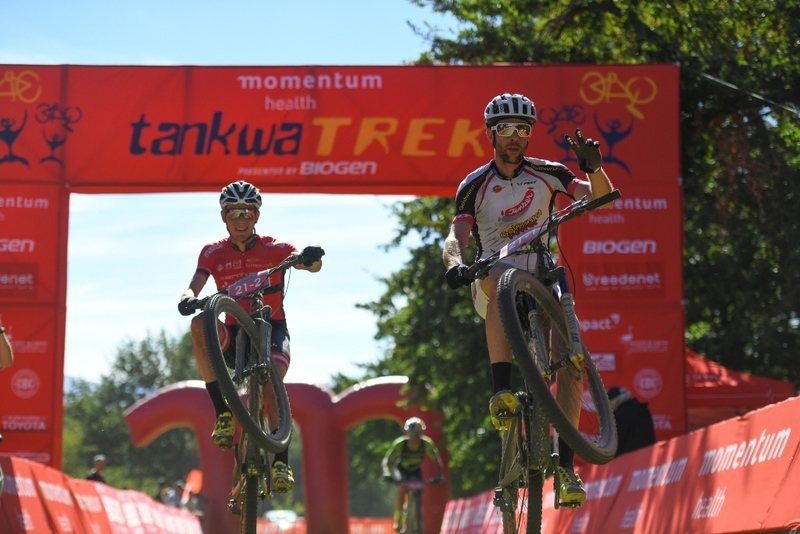 South Africans Mariske Strauss and Yolande de Villiers won the final stage of the Momentum Health Tankwa Trek, presented by Biogen, on Sunday. 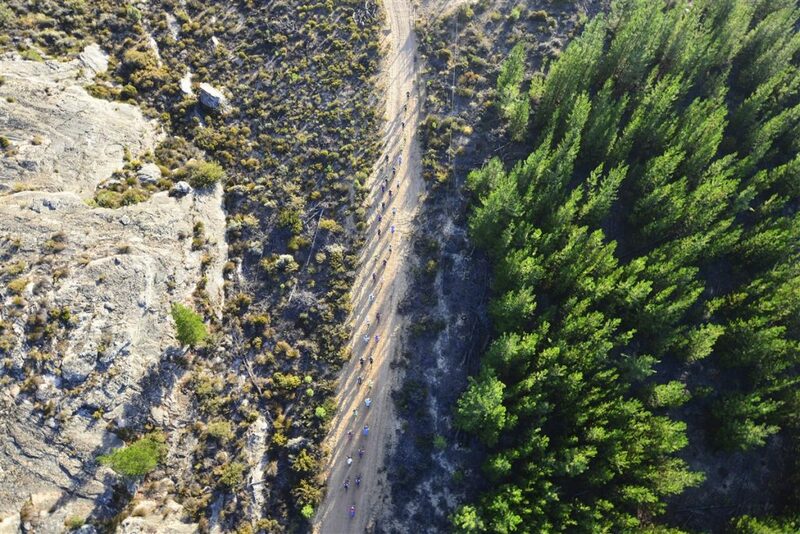 But the Swiss/Swedish duo of Esther Süss and Jennie Stenerhag claimed the overall victory after three days of fierce racing in the rugged Kouebokkeveld region of South Africa’s Western Cape province. After winning Stages 1 and 2 quite convincingly, fate struck Süss and Stenerhag (Meerendal/CBC) after 18km of the 89km stage when they had to stop to repair a puncture sustained by Süss. 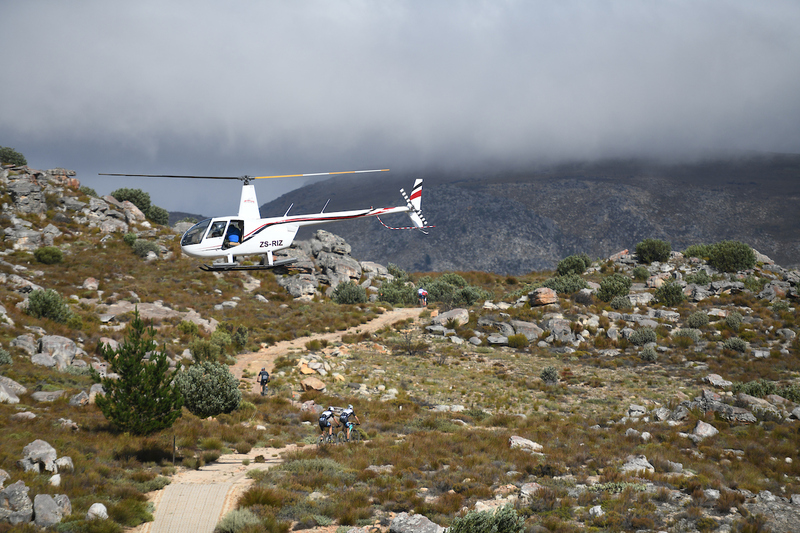 This opened up the racing for the final-stage podium and Strauss and de Villiers (OMX Pro) and Candice Lill and Vera Adrian (dormakaba) were ready to oblige, tackling the stage’s signature singletrack sections with renewed intent. For de Villiers and Strauss, the General Classification was also a consideration. 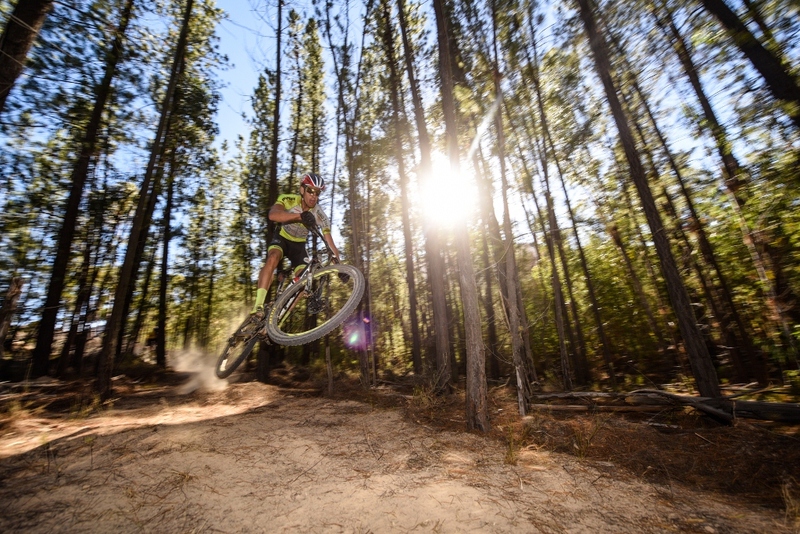 Even though they started the day with a 13-minute deficit to the Meerendal/CBC pair, they’re experienced enough to know that mountain bike mechanicals can rob riders of huge chunks of time. With generous prize money and International Cycling Union rankings points up for grabs, there was a lot at stake. Süss and Stenerhag repaired the tyre with a plug and then found themselves in pursuit mode for the rest of the stage. 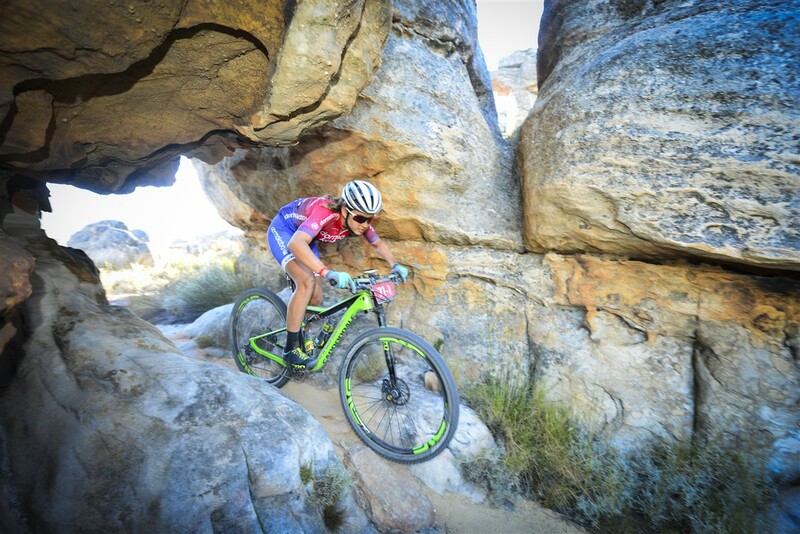 Strauss is the current national XCO champion and she led de Villiers smoothly and swiftly through the long sections of singletrack that wove its way through the rocky landscape. Although Süss and Stenerhag managed to catch and pass, the dormakaba duo, they fell short of closing down the OMX Pro pair, who crossed the finish line in a time of 03 hours 30 minutes 23 seconds. Süss and Stenerhag were second, almost two minutes later with Lill and Adrian rounding out the podium places another four minutes later. 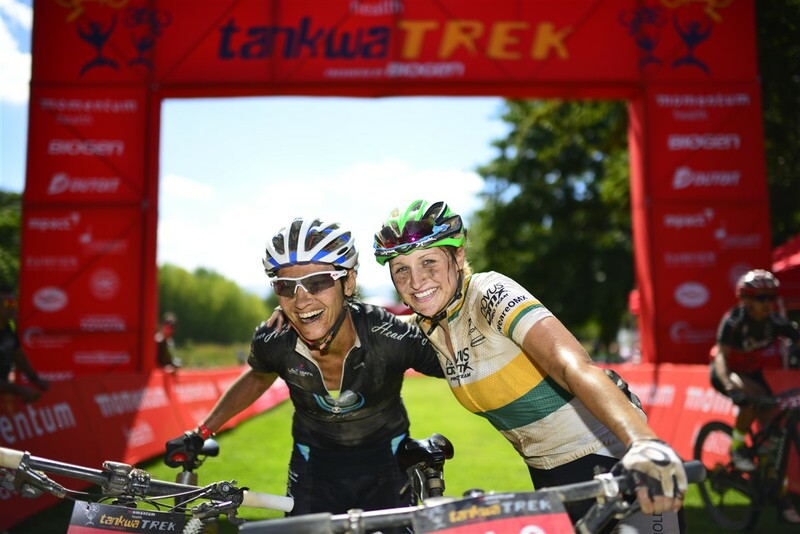 Jennie Stenerhag – along with Esther Süss (left) – won her third consecutive title at Momemtum Health Tankwa Trek, presented by Biogen on Sunday. “It all came together for us on the final day. I dropped my chain about 15km in. We paced back hard to the leading women and just as we reached them, Esther got a flat. Along with Candice and Vera we then pushed the pace and at some point we rode clear of them. Then it was a matter of just hanging on to our lead because we heard time gaps and knew that Esther and Jennie were catching. But we held on and we are really happy with the win,” smiled Strauss. “It was very tough!” exclaimed de Villiers. “Mariske is like an Energizer Bunny! So much energy and she knows how to ride a bike. The fast pace and the pressure of trying to get into the singletrack first really made it a hard stage. But the trails today were awesome. This is a proper mountain bike race route. It was hard but we enjoyed it so much,” said De Villiers. “Esther’s puncture came on the open road, where we were in bunches with the men. The pace there was fast and a lot of bunches passed us while we were repairing the tyre, which took longer that it probably should have,” said Stenerhag. “But it was a good test for us as a team to see how we cope with this kind of thing and it prepares us well for the Cape Epic. Staying calm and chasing back became our priorities. This is the fifth time I’m doing this race and I know this final day route quite well. As we got near the first section of singletrack we caught a huge bunch. I said to Esther we HAVE to get past them or else we’ll get held up. We rode super hard and managed to get around them just before the singletrack started, giving us a mostly clear run,” explained Stenerhag. “The next really long section of singletrack wasn’t as open for us, but most riders had seen we’d flatted earlier and we very kind in letting us past. After that section we could see the other women and by the final water point our gap was down to 1:30. We decided to change Esther’s wheel there because she was losing pressure in the tyre. I thought we’d be able to still catch OMX Pro but they rode really well. We are still very happy to get the overall win though,” added Stenerhag. Riders tackle a sandy gravel road during the early kilometres of Stage 3 of the Momemtum Health Tankwa Trek, presented by Biogen on Sunday. “We plugged and pumped my tyre and really had to work hard to fight back. We were on our own and I think we did really well. As we were approaching the last water point, where I changed my wheel, I noticed my dropper seatpost was broken and wasn’t returning to the normal height. I had it fixed it at the tech zone and from there on I was worried it would break again, so had to be careful for the rest of the stage. Luckily it held and we were able to finish okay,” said a relieved Süss. Süss and Stenerhag collected R80 000 (5600 Euro) for their overall victory, the same amount as the men’s overall winners, courtesy of Anderson Transport, which boosted the women’s prize purse to match that of the men. Strauss and de Villiers finished second overall with Lill and Adrian completing the final overall podium. 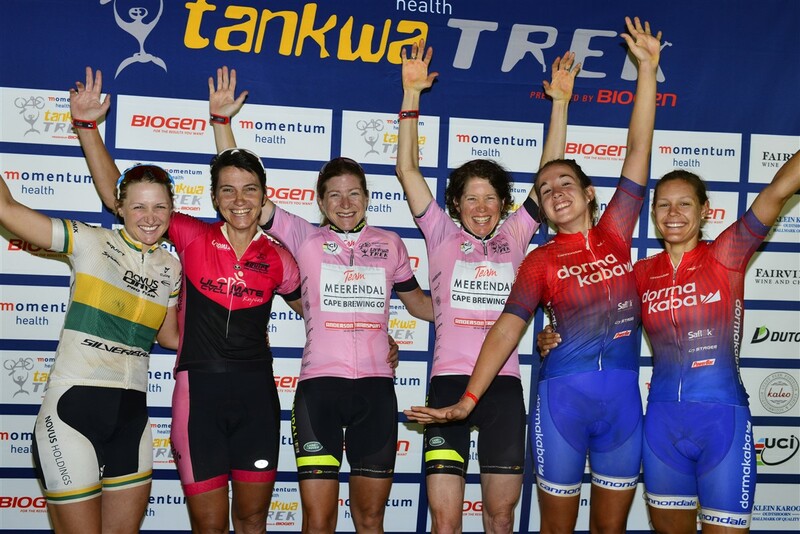 The win was the third successive Tankwa Trek for Stenerhag, who won the previous two editions with South African Robyn de Groot, who won the 2017 Mixed category with her Ascendis Health teammate, Gert Heyns. Runners-up in the Mixed division were Team Valencia’s Grant Usher and Amy Beth McDougall with Charles Mcfall and Carmen Buchacher (Velocity Sports Lab) rounding out the podium places. Candice Lill makes her way through a rock formation section during the final stage of the Momemtum Health Tankwa Trek, presented by Biogen on Sunday. 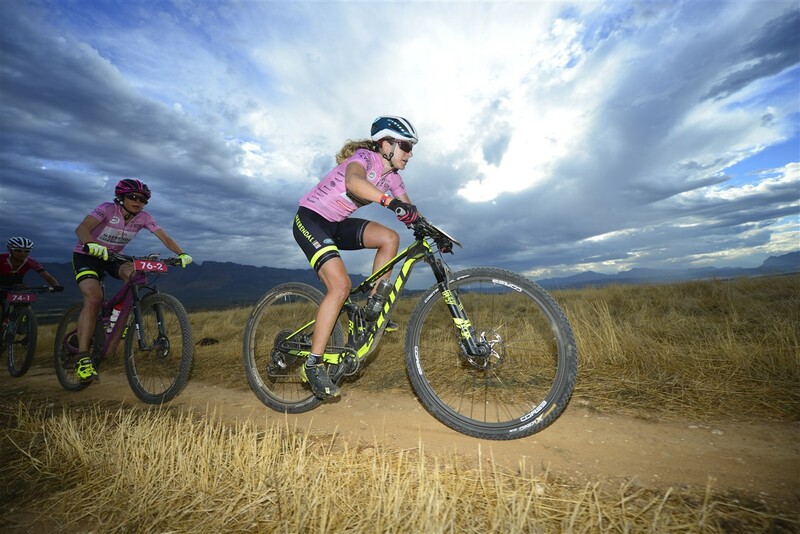 In the Solo women’s division, Jeannie Dreyer was dominant, winning all three stages and the overall title ahead of Dalene van der Leek and Reinette Geldenhuis respectively. Esther Süss (left) and Jennie Stenerhag celebrate winning the overall title of the Momemtum Health Tankwa Trek, presented by Biogen on Sunday. The Tankwa Trek women’s GC podium. From left to right: Mariske Strauss, Yolande de Villiers, Jennie Stenerhag, Esther Suss, Candice Lill and Vera Adrian. Photo by www.zcmc.co.za.